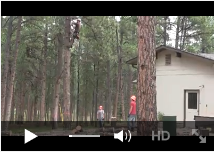 We operate mainly in the Colorado Springs area and continue to build our business by providing excellent customer service, competitive estimates and quality tree care. Improper pruning methods, by unskilled arborists with unsanitised tools, can prevent a tree from healing properly and lead to the spread of certain diseases. We at Advanced Tree Services LLC realize that most trees will inevitably outlive us and we make every effort to preserve this. as a result we are a company dedicated to conservation.